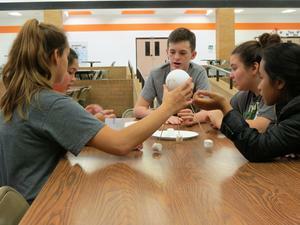 Four Destination Imagination teams from Smithville Jr High met on Saturday, December 15th for a day of creativity, problem-solving, and theater games. Destination Imagination is a volunteer-led, educational non-profit organization that teaches "21st century" skills, presentation, production, and STEM principles to kindergarten through university level students utilizing standards-based collaborative problem solving challenges. Every Year, Destination Imagination releases seven new challenges, pertaining to different subject matter areas that a team must solve.Teams then have until the date of their first tournament to work on the challenges. All challenges include a presentation portion, rehearsed or on the spot. The Smithville Jr High teams, coached by Travis Kearns and Shelly Huerta, compete with other Middle School students starting at the Regional level in February. Students can be individually recognized for creativity, leadership, and problem solving and winning teams move on to State and possibly Global level competitions. Problems focus on Science, Structural design, service learning, technical skills, engineering, Improvisation as well as the fine arts and humanities. The workshop featured theater specialist Kate Jaskolski, who trained at Pepperdine University and holds a Masters degree in Theater from New York University. Mrs. Jaskolski currently teaches theater at University of Cape Town in South Africa and is the founder and director of Nigeria’s Premier Inclusive Theater. After Warming up with a few Theater games, the student worked on short productions, songs, improvisations, and solutions to a series of problems that society currently faces. They also worked on basic theater skills such as public speaking, stage movement and positioning, and improvisation. Coach Travis Kearns hopes the students gain confidence along with the presence, creativity, and adaptability that comes with theater skills and the Destination Imagination Program. A special thank you goes out to Farmers Insurance Agent, Scott Saunders, Jr. for sponsoring lunch for the workshop.